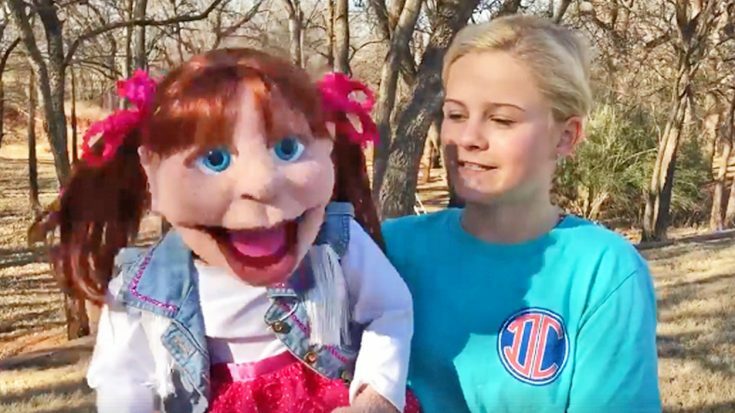 While promoting her upcoming Nashville performance at the Ryman Auditorium on Saturday, March 10, Darci Lynne Farmer shared the spotlight with her yodeling cowgirl puppet, Katie. Singing ventriloquist Darci Lynne won Season 12 of America’s Got Talent in 2017, and stunned viewers week after week with her incredible talent. Each week she brought out a different puppet to help her, but we actually never got to see Katie on the show. But don’t worry, Katie is included in her shows since AGT! In the video, Katie sang the opening lyric to John Denver’s iconic song “Take Me Home, Country Roads” and Darci chimed in for the next part. They traded off just a couple lines before the duet ended, which left us craving for more! During her final AGT performance, she had two puppets on stage with her – Oscar and Petunia – and they sang a duet. We imagine that was extremely difficult, but we could argue that her latest duet with Katie might be a little harder. Instead of going back and forth changing her voice while staying in ventriloquist mode, she had to change her voice between Katie’s and her own, and remember to actually move her mouth when it was her turn!